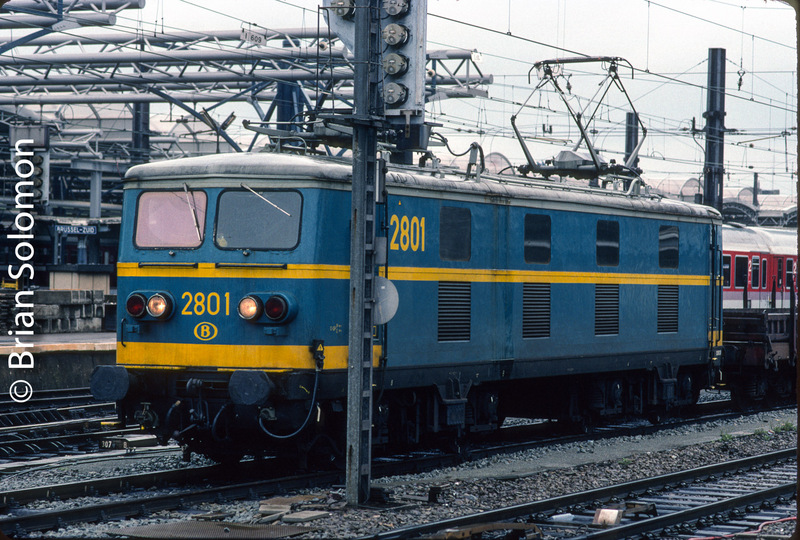 SNCB at Brussels Midi 22 Years Ago! 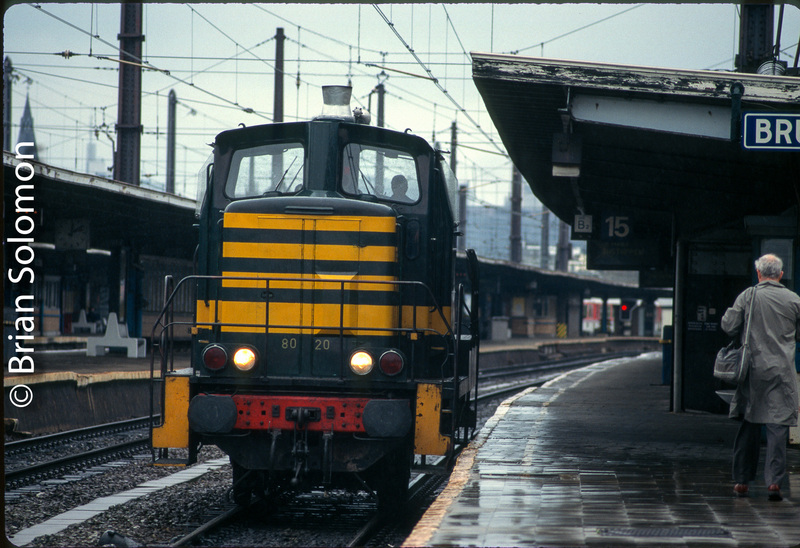 Upon arrival from Köln, Germany On this day, 25 May 1996, my father and I made photographs in the rain at Brussels Midi. I’ve since returned to Brussels on many occasions when the weather has been more hospitable. 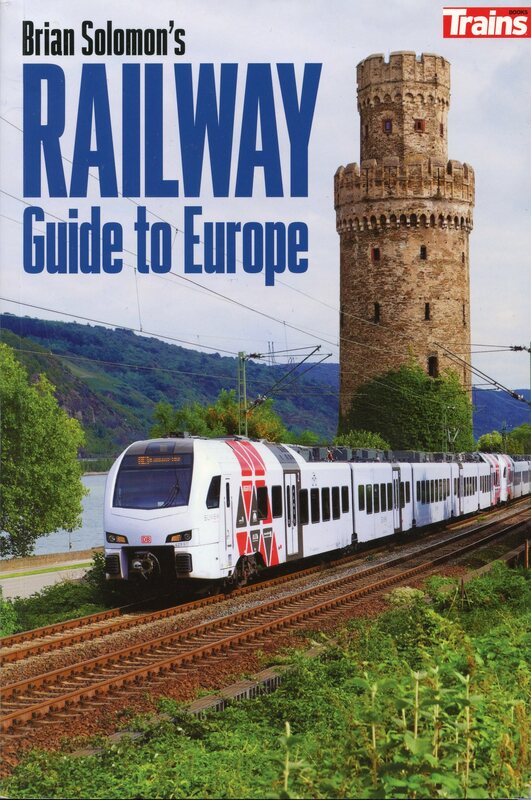 Brussels is among the cities profiles in my new book Brian Solomon’s Railway Guide to Europe, now available from Kalmbach Books/Kalmbach Hobby Store. Located adjacent to the SNCB lines at Schaarbeek (on the north side of Brussels), Train World is Belgium’s premier railway museum. I visited last week, having arrived by train from the Brussels suburbs. I’d bought my museum ticket in conjunction with my SNCB fare. City trams also serve the museum. You enter Train World from the old railway station building, which has been beautifully restored. Beyond are a series of train halls, that display the history of Belgian railways using real equipment: locomotives, railway rolling stock, signals, literature, signage, etc. Tracking the Light aims to post new material Daily. 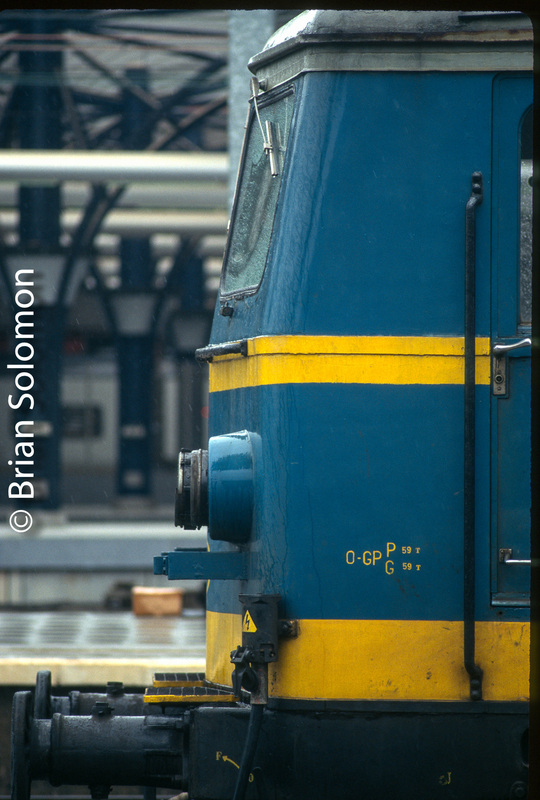 Hidden Treasures: Preserved Locomotives at Saint Ghislain, Belgium; Don’t miss Brian’s Exposure Guide for old Locomotive sheds. Mauno Pajunen organized a visit to this collection and provided translation while Rousman Phillippe offered a guided tour. 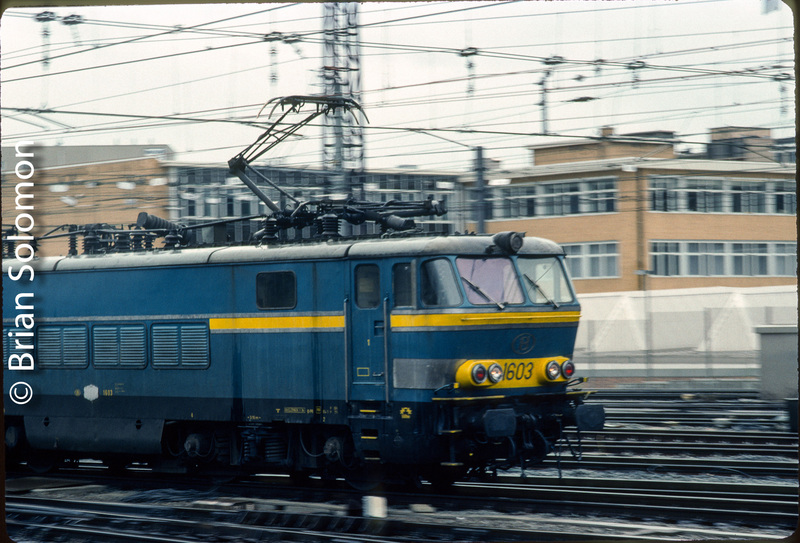 I was most impressed by the semi-streamlined stainless-steel clad electric (SNCB 1805) that formerly worked TEE international services and by the Baldwin diesel locomotive built under license. Until my visit the to the shed at Saint Guislain, I’d only seen this class of locomotive in old photos. The pitched cab profile and stainless-steel side panels are very pleasing. They just don’t style locomotives like this anymore! Photographing in a locomotive shed such as this one requires special technique. If you just let the in-camera meter do the work you will get under-exposed (dark) images such as this. Why? Because the camera meter is trying to balance the scene for the window which leads to overall under-exposure. Action on the photographer is necessary on-site to avoid this problem. If you are not careful you may end up with an unacceptably dark result. (see above). By manually controlling the exposure you can compensate for the effect of windows and skylights, thus creating a more pleasing exposure inside the shed. My solution is relatively simple: manually over-expose in range of 2/3s of a stop to 1 stop, and then control highlight detail in post processing. The easiest way to do this with a digital camera is used a manual mode and then watch the suggested exposure settings offered by the built in meter and then add 2/3s to 1 stop to the recommended value. Thus if the meter suggests exposing a f2.8 at 1/60th of second, open up the aperture to nearly f2.0 without changing the shutter speed. Another way of doing this is by adjusting the meter to over expose by 2/3 or 1 full stop. Each camera has its own means of doing this. In my case, I set the ISO to 400, so my average exposure was f4.5 1/60 of a second (camera meter was recommending f5.6 to f6.3, which would have resulted in an unacceptably dark image). I adjusted my exposure from scene to scene, while tending toward overexposure based on the meter setting and carefully gauging the histogram to avoid loosing data in the shadow areas. Since the highlights of the outside windows and skylights are not important to the overall scene, it isn’t a problem to allow for a loss of detail in these areas. After exposure, I adjusted the files in post-processing to bring the mid-tones and shadow areas to an expected level. This was one of my favorites: a Baldwin diesel built under license. Careful exposure allowed for adequate detail of the trucks and underbody. Wide angle close up of Walschearts valve gear. Old Egide was a Belgian after all! Another trick is working in confined spaces. For these images I used a super wide-angle lens, specifically a Zeiss 12mm Touit, which I purchased specifically for photography in settings such engine sheds, signal towers and locomotive cabs. The end of the line for SNCB! A Dozen photos at Quiévrain. International borders are often bad for railways. An invisible political boundary (the dashed line on a map) can prove a greater obstacle than a towering mountain range when it comes to impeding railway operations. In mid-April, my Irish friends and I explored the Gotthard Pass, where massive investment will soon make the old line over the mountain redundant as the new 35.5 mile Basistunnel beneath the Alps will divert most of the through traffic. A week later I was exploring the border area between northern France and Belgian Wallonia with Mauno Pajunen. This is in an area of relatively dense population that was once the center of a thriving coal mining community. Quiévrain, Belgium is a town located an hour or so from Brussels and is relatively near to large French cities of Lille and Paris. The tree growing out of the roof of the old station is indicative the sad state of the railway here. Despite the poor state of the facilities, SNCB continues to provide a relatively frequent passenger service to Quiévrain. 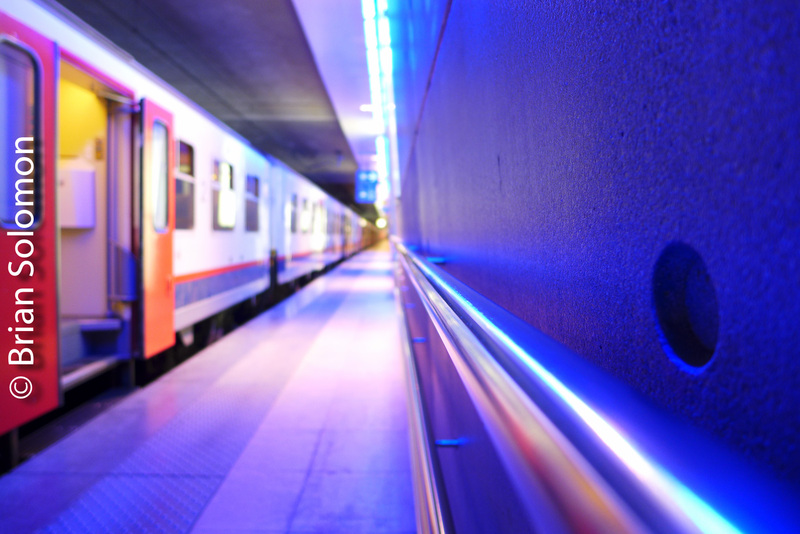 Electric trains offer an inexpensive and comfortable way to travel to Mons and Brussels where connections are available to many other cities across the country. Generally speaking SNCB (Belgian National Railways) provides an excellent service across Belgium, with most stations seeing at least an hourly passenger service and many lines operating with an even greater frequency. At one time a through railway line connected Belgian cities of Brussels and Mons with the French city of Valenciennes via Quiévrain . Today, SNCB continues to operate a regular interval passenger service from Brussels to Mons with some trains continuing south to Saint Ghislain and Quiévrain. But Quiévrain is the end of the line and the state of the station area is a sad reflection of better times now long gone. This was once a handsome station. Evidence of the old line remains and the tracks are still in place (although no longer connected). The town is divided between Belgium and France, with the French town being called Quiéverchain. Differences in the price of tabacco and alcohol between the two countries has led to a thriving business on the Belgian side of the border. Here we are at the French-Belgian frontier which divides the town of Quiéverchain/Quiévrain. Good luck getting through the place by rail! Oh dear! The connecting stink buggy has arrived. SNCB provides excellent signage at stations. It had been many years since you could take a train directly from Mons to Valencienes. In theory, you can ride from Brussels to Valenciennes via a change of trains at Lille, but this is the long way around and impractical for regular travelers. Elsewhere in Europe cross-border services have flourished, yet the end of track at Quiévrain clearly demonstrates how borders create barriers between population centers that need not exist. Soon you will be able to travel faster than ever before from Zurich to Milan, but not by rail from Mons to Valenciennes! Only a short walk from the end of track will reveal evidence of the old line that once continued across the border. A ghost from another era. I find disused railways sad, yet fascinating. Like discovering evidence of a forgotten empire. Riding in the eerie glow of dusk from Charleroi to Ottignies, my SNCB (Belgian Railways) train passes the romantic ruins of a medieval abbey. I looked this location up on line and learned that it was called the Villers Abbey, and is a popular attraction in the Wallonia region of Belgium. The next day, I returned by road with some friends who lived nearby to expose these photographs. The old abbey makes for a fascinating subject, while the railway provides added interest. Villers Abbey, FujiFilm X-T1 photo. Perhaps I’d been living under a rock, but I’d never heard of this place before. It’s certainly one of the more interesting places to photograph trains in Belgium. Elevation is available on the east side. Low evening sun suited the environment. Yet, I think a foggy morning might offer an even more evocative atmosphere. Someday, I’ll have to try it again! Which is a more compelling image? The train in the distance, or up close? I’ve passed through Charleroi, Belgium at various occasions over the years. For me it is a place similar to Newark, New Jersey. Like Newark: Charleroi offers connections between transportation modes and is the location of an important secondary airport and has a light rail-subway that blends an historic network with modern construction. Also, both city’s environments are characterized by post-industrial backdrops. On Thursday, October 1st, a change of trains at Charleroi afforded me a 40-minute window to make photos. Rich polarized sun at the end of the day made for some nice lighting to capture the city’s trams and SNCB trains. SNCB station at Charleroi Sud. Lumix LX7 photo. TEX Tram at Charleroi Sud. Lumix LX7 photo. TEC tram catches a wink of sun on 1 October 2015. FujiFilm X-T1 photo. My train to Ottignie at the SNCB station at Charleroi Sud. Lumix LX7 photo. Low sun offers contrast and rich lighting that is well suited to making dramatic railway images. 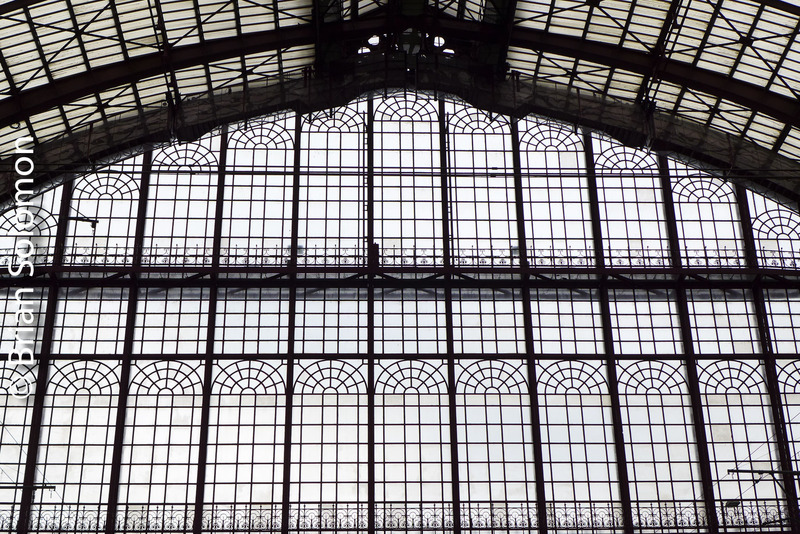 A Dozen New Photos: Antwerpen Centraal‑Part 2. Antwerp Central Station—Fuji X-T1 photo. Today’s Antwerpen-Centraal is a blend of architect Louis de la Censerie’s elaborate and elegantly adorned station building and spacious balloon-style shed with two modern new levels. The lowest level provides through connections to the north. The original station opened in 1898, while the improved and expanded modern terminal reopened in 2007. I revisited this railway wonder of the modern world at the end of March 2015. Yesterday I presented a few interpretive images, today I present an more literal collection of images. Antwerp Central Station—Lumix LX7 photo. La Hulpe Station at Night, March 2015. On an evening last week, using my Lumix LX-7, I exposed this time exposure of Société Nationale des Chemins de fer Belges’s (Belgian National Railways or SNCB) Gare de La Hulpe. This railway line is being transformed from double track mainline line to a quad track line to facilitate an improved suburban service akin to the Paris RER. Exposed using a Panasonic Lumix LX7 set at ISO 80 at f1.7 for 5 seconds. To make this image, I rested the camera on the bridge railing, exposed a pair of trial exposures to gauge the lighting conditions, then set the camera (shutter speed and aperture) manually to allow for sufficient exposure of the sky and shadow areas. As previously mentioned on Tracking the Light, to make successful night photos it is important to give the scene sufficient exposure (usually 2/3s of a stop more than allocated by many built-in camera meter settings), while keep the camera steady for the duration of the exposure. Keeping flare to a minimum is also helpful. Lumix LX-3—part 2: Existing Light Digital Night Shots. When I was visiting Brussels last weekend, I made a series of nocturnal images of the city and its transport. Below are a few of my favorites. Brussels Central Station is largely below street level. Access to the platforms is via this modern ground level building. I exposed this image on the evening of March 22, 2013 using my Lumix LX3 set at ISO 80 in ‘A’ (aperture) mode with a +2/3 exposure over-ride (to compensate for the night sky and highlights from streetlights). The final exposure was f2.8 at 1 1/3 seconds. Sometimes it’s best to take an opportunistic approach to urban photography. I made this grab-shot with my Canon EOS 7D (fitted 28-135mm lens set at 5000 ISO) from the front seat of a Citroen Picasso paused at a set of traffic lights. Panning the tram using slow shutter speed minimizes the visual defects caused by shooting through a car window. The combination of twilight, streetlights, and motion make for a surrealistic image. A Brussels PCC tram glides along at dusk on March 24, 2013. Exposed with a Canon EOS 7D fitted with 28-135mm, set at ISO 5000 f3.5 1/30 second. Belgium’s jewel is among Europe’s most magnificent railway terminals. Antwerpen Centraal, Belgium on March 22, 2013. Author Carroll Meeks (The Railroad Station, 1956), credits architect Louis de la Censerie with the station’s Art Nouveau style. Censerie’s ornate decoration and exceptional use of light makes Antwerpten Centraal one of Europe’s finest railway terminals. Photo exposed with a Panasonic Lumix LX-3. 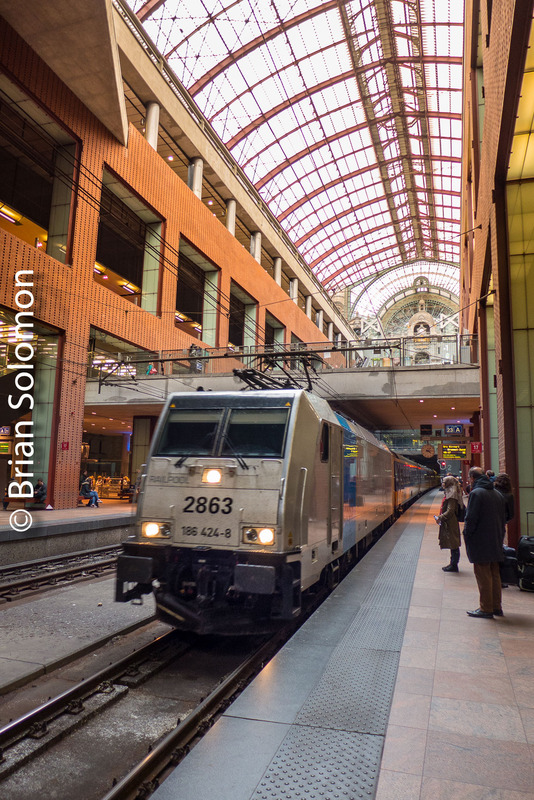 On the morning of Friday March 22, 2013, I rode an SNCB (Société National des Chemins de fer Belges—Belgian National Railways) train from Brussels to Antwerpen Centraal (Antwerp Central Station). It was bright and sunny, a real contrast to my experience in Dublin on the previous day where it was cloudy, windy and raining. I first visited Antwerpen Centraal in May 1996. Since that time this classic stub-end terminal has been transformed into a three-level railway intermodal center. Tracks on the lowest level permit through services without the need for trains to reverse direction as was previously required. 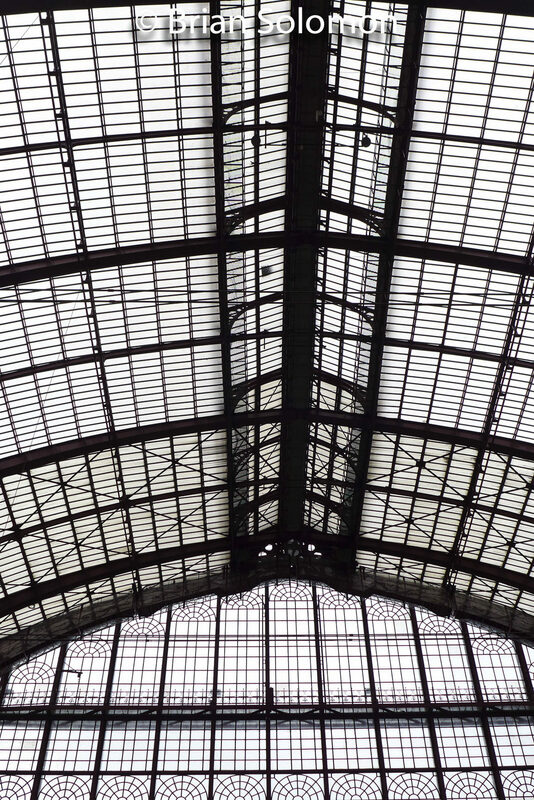 Looking straight up at the domed roof in Antwerpen Centraal, Belgium on March 22, 2013. Lumix LX-3. The station head-house is among the most opulent and best kept anywhere in Europe, while the steeply pitched balloon train shed makes for a wonderful venue to photograph trains, its glass windows acting as enormous soft-box. On Friday March 22nd, I had about 45 minutes at Antwerpen Centraal between trains. I used my time to good advantage and exposed a variety of digital images with my Lumix LX-3, and some Fuji Provia 100F with my Canon EOS-3. The film will be processed at a later time. New SNCB electric multple-unit at Antwerpen Centraal, Belgium on March 22, 2013. Lumix LX-3. The terminal is well-suited to the city center and connected to myriad destinations through an excellent public transport system operated by De Lijn. This includes a 1000mm gauge tram network that still hosts vintage President Conference Committee (PCC) streetcars. PCC Streetcar near Antwerpen Centraal on March 22, 2013. My layover at Antwerpen Centraal was a sideshow to my main effort: I was on my way to a location near Antwerp port where I was aiming to photograph freight trains. Keep your eye on this space for those images!